Edited by Kashef Chowdhury. With essays by Robert McCarter and Alejandro Aravena. Photographs by Eric Chenal and Hélène Binet. Over the past years, Dhaka-based architect Kashef Chowdhury has become renowned for a body of work that responds with great sensitivity to places, local circumstances, and the demands of a building’s users. At the 2016 International Architecture Exhibition of the Venice Biennale, Chowdhury presented four recent projects his firm URBANA has realized in Bangladesh in a fascinating exhibition, which he has designed with equal sensitivity and care. The labyrinth is an age-old space of intrigue, discovery and accident, which has fascinated architects throughout history. For his installation in Venice, Chowdhury challenged spatial perceptions by a simple turn: the labyrinth, which hides and blocks, suddenly becomes transparent. Notwithstanding the obvious reference to Venetian glass, the labyrinth retains, or even accentuates, a sense of spatial disorientation. The installation was conceived not merely as a hyper-maze but rather as an expression of the anxiety that the artist experiences in his work due to a myriad of uncertainties. From design to construction, funding to maintenance, the part of the world where URBANA chiefly works presents itself with challenges at every turn, and it is in this milieu that an architect must operate with firm resolve. Chowdhury’s Glass Labyrinth in Venice seems to explicate the notion that, although an architect has a clear vision of what he he wants to do, the path to achieving that in the environment he operates, is with laden with perplexing barriers. 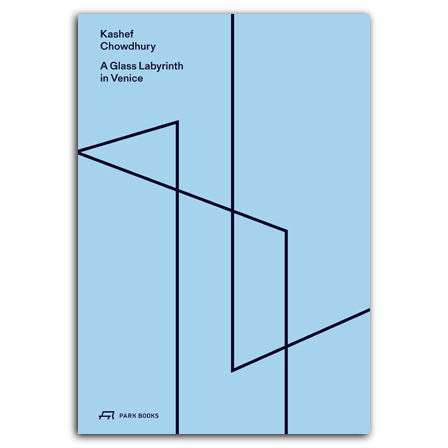 This new book explores and documents Kashef Chowdhury’s intriguing installation in Venice in beautiful photographs by Eric Chenal and with an illuminating text by Robert McCarter. is an architect and executive director of the architecture firm Elemental S.A. in Providencia, Chile. He is the 2016 Pritzker Prize Laureate and has been director of the 15th International Architecture Exhibition of the Venice Biennale in 2016.
führt in Dhaka das Architekturbüro URBANA, das seit 1995 ein international viel beachtetes und preisgekröntes Werk geschaffen hat. Für das Friendship Centre in Gaibandha, Bangladesch, wurde er mit dem Aga Khan Architecture Award 2016 ausgezeichnet. ist praktizierender Architekt und Professor für Architektur an der Washington University in St. Louis, Missouri. Er ist zudem Autor zahlreicher Bücher, darunter Monografien bedeutender Architekten wie z.B. Alvar Aalto, Marcel Breuer, Aldo van Eyck, Steven Holl, Louis I. Kahn und Frank Lloyd Wright. Alle Bilder dürfen nur im Zusammenhang mit einer Buchrezension verwendet und müssen mit dem entsprechenden Copyright-Hinweis abgedruckt werden, den Sie mit den bestellten Bilddaten erhalten.